Maker of stuff: Happy Day of Explosive Celebrations! Someone I know introduced me to this word. It is all about doing that itty bitty part that you Can do to change something. That random act of kindness, or even just picking up a piece of litter and disposing of it properly. If everyone did a little bit, even one percent a difference would be world wide. What could you do in your life to make a possitive change? Recycle, compost, garden, take an elderly neighbor to the store or out to lunch? 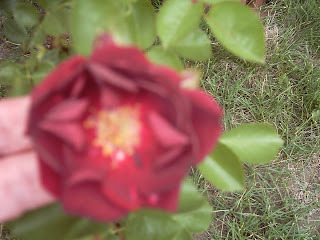 This is an old rose in my yard, fragrant and sweet. My wonderful neighbor Paul said he thinks the name was baby doll kisses. Even if it isn't the name is precious!